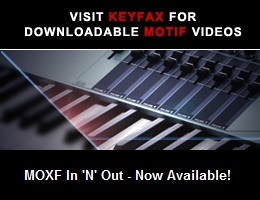 Viewing topic "Playing MOXF8 from another keyboard"
I’ve just bought an MOXF8 solely for live gigging. I want to play MOXF8 voices from my Hammond SK2 (eg strings) while still playing different sounds on the MOXF8 keyboard. Can I do this? Yes, what you’re asking for can be done. The sequencer modes (Song and Pattern) are multitimbral. Up to 16 MIDI channels can be addressed in each Song or Pattern Mixing. The SK2’s MIDI transmit channel just has to match a Part’s Receive Channel in the MOXF’s Mixing.